This is my rap to drummers looking for endorsements... and it's not pretty. This is not about how to go about getting an endorsement from a drum or drum gear company. It's about how some companies have abused the concept of the endorsement program to the point that it is not as effective as it once used to be! It behooves drum manufacturers to have well known drummers endorse their product if the drummer's opinion and use of the instrument influences others to buy that brand, so they PAY them with free drums, support and sometimes money. BUT the majority of "endorsements" these days are not endorsements at all. They are really discounts to drummers who are not THAT influential, if at all. Not that that is a bad thing, but it must be realized by the drummer who is paying for the instruments that he IS paying for the instrument and the manufacturer is most likely making a bit of profit on the sale even if the discount is called "at cost." I always thought the term Key Player deal was a more appropriate name for this. I know Yamaha has or had a Key Player level. It probably does not want to be heard but most new and smaller companies regard what is usually called a "B" or "C" endorsement deal as a SALE to that "endorser" that will influence other sales. In other words, their goal is getting the drums out there so they can be seen and heard in public, generating the sales. The name, performance or opinion of the "endorser" is secondary. They just want sales and a lot of pictures of drummers playing their drums on their website. There are many levels of endorsements... AND by the way - just to get the semantics right - the company does not endorse you, you endorse the product. You don't "ask" for an endorsement. You ask the drum company if they would like for you to be an endorser of their product. When I first endorsed drums and cymbals and sticks, I learned that the endorsers who get paid or get free fear usually don't have to approach the company at all; the company approaches them and asks for their endorsement. I just recently had someone send me an email asking for an endorsement from the Not So Modern Drum Company when it clearly states on my website that the Not So Modern Drum Company does not have an endorsement program of any kind. I emailed back and asked them if they had even heard the instruments and, of course, they hadn't. If the drummer is asking to be an endorser just to get free gear, then why would a builder or manufacturer want to endorse such a drummer who is not making enough money in the music business to buy gear, or not performing enough to have any influence on potential customers? I have seen many new small companies go out of business quickly by giving their gear away to the wrong people - many of who will then sell that kit or set of cymbals and beg free gear from another company. Being an endorser does not get you gigs, does not make you a star and does not make you more well known in the drum world. Having your picture on a website or in a catalog with 200 other drummers who got "endorsement" discounts does not advance your career. The goal is to become a great drummer, and along with that comes recognition of your influence by the public and the drum companies. The whole endorsement scene has become so diluted. Most people are not impressed with unkown endorsers, with their faces in tiny pictures. 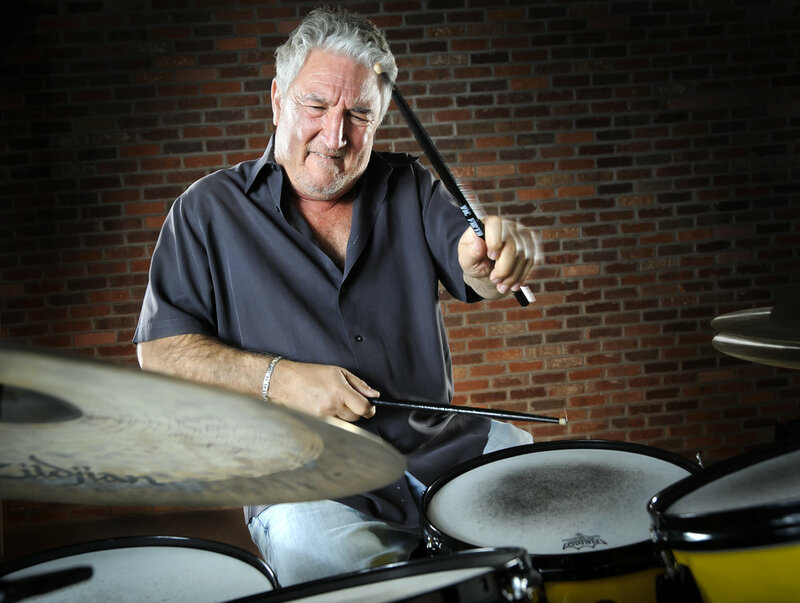 If I were to pay or compensate an endorser, I would wait for ONE, a very influential famous drummer whose endorsement of my product will increase the demand for my product. Not saying that the B and C endorsement programs don't work if run right. Just saying that a good A program with "real" endorsers would attract more sales at a profit margin that would buy some steak once a month, and pay the electric bill to keep the drum drills and drum routers spinning. Also a “bottom heavy” endorsement roster with unknown drummers buying direct from the manufacturer is not appealing to dealers. It has become commonplace for dealers to cut off relations with companies who sell direct to customers through a too liberal endorsement program. A company that bypasses the dealer is cutting its own throat in the long run. Silver Badge Supraphonic prototype controversy? I recieved this query from a reader... " I was wondering if you could verify the claim of this drum. I'm interested, but I think it's one of those too good to be true items. I've included the ebay listing link. Thank you." I'm not going to post all the pictures here, but here is the entire description from the Ebay listing. Notice that the seller is being very honest about the origin of the drum, but it looks likes the badge is real. You can read my opinion about the authenticity of the drum at the end of this article. "Originally listed at $1000, but i'm strapped for cash. My research has pointed to this being a prototype or accompanying a prototype set. Up for grabs is what I would consider to be an Ultra-RARE silver badge supraphonic. (More info in silver badges-see below) I don't know much about this as there isn't much info available about a silver badge. I'm guessing it's around and early 70's supraphonic, around the time they made the stainless drums kits. It is possibly number 431 of 500 or less. Not sure. The number 431 is hand etched onto the badge. It also does not appear to have been changed as far as the badge from what i can tell. The grommet looks original, flush to drum, and the inside is flush as well. Very interesting. It's basically a bonham drum, but in the 5x14 size... I bought this last year along with several other similar drums and need to sell ASAP. Will have a reasonable make offer limit, so make me an offer! I cannot make any guarantees about the rarity of this drum, but my guess is it is more rare than than the famed NYC Board of Education drums, and the orange peel acrolite prototypes. If you know anything about the history of this drum, I would be glad to hear it. Nice drum, good condition for its age. Some pitting/flaking of chrome but in overall good shape. Look at the photos for condition, as I've tried to document as best I could. Ships with insurance, and packed very well. No returns, as-is. I've had too many items returned in a condition not like I sent so, sorry. Please see this link for information on where i believe this drum originated. 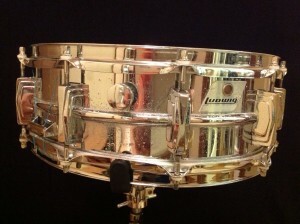 "The Ludwig engineering group used the silver hand scribed badges whenever they were prototyping a new design, or were interested in tracking a particular drum. I personally saw an all aluminum Acrolyte set which used the silver hand scribed badges which never made it to the production line and was never offered for sale. It had an Acrolyte snare with a silver hand scribed badge. The blue/olive badges were used on all general production drums, even on the stainless sets which were shipped (except for a few), and as everyone knows, Ludwig did not keep track of those those blue/olive badges. The log which contains a listing of silver hand scribed badges is missing in action, probably in piles of old engineering documentation somewhere. One thing I can tell you for sure is that your drum is VERY rare and had a special purpose at one time. Dan"
".....I'm hoping we can answer all things stainless steel. I do know the original prototype where not badged, from the 60's yes that's right 60's, the Rob Cook Ludwig book shows one of these kits! The 70's prototypes where badged with what looked like the pointed blue olive badge, but were silver with only the LUDWIG name on them and the serial numbers where etched in the badges by hand! And one of the old steel society guys has one of those kits, Ludwig distributed these to only their top dealers in the US, by this they where able to gauge the public's reaction to them, which was a bonafide success!!" No guarantees on the rarity of this drum. Even the guys at Ludwig were stumped on this one..."
That looks pretty sketchy to me. The badge looks real but is it a prototype? I think not. There are a couple of things wrong with the quotes. The first quote is referencing an acrolite, so that makes that quote irrelevant other than the comments about prototypes. The second quote does not mention a snare drum at all. Also, that is a stock aluminum Supraphonic 400. You can tell because of the flaking. Only the aluminum Supras flaked. The brass ones didn't flake and if there was a steel Supra it would not be flaking like that. The reason the chrome flaked off of the shell is because aluminum does not like to be chromed. Almost all of them flake eventually. This is unverified from me, but I have heard that a few steel Supras were made. I suspect what happened there was that a small number of stock aluminum Supraphonics were rebadged to be sent out with stainless steel kits. That is the most logical answer. 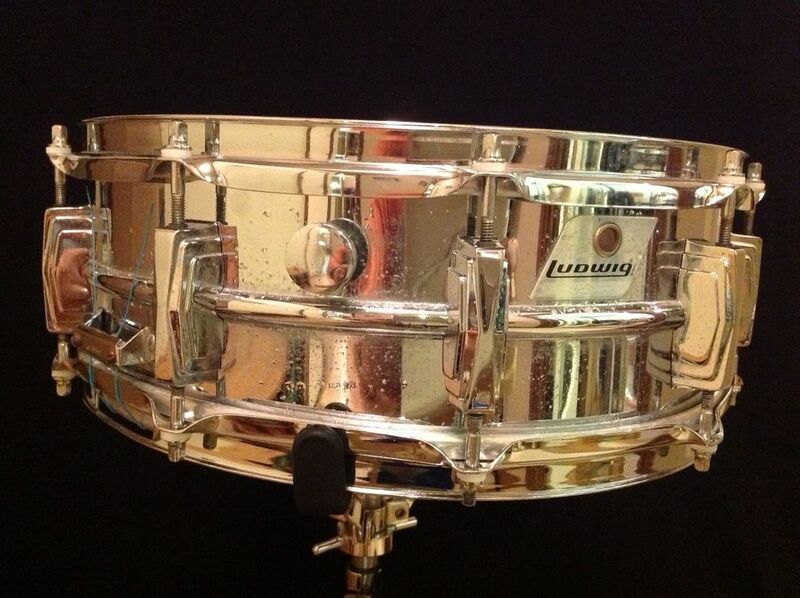 Ludwig never advertised a stainless steel Supra. Stock Supras were sold with the stainless steel kits. Now, on the other hand, that is an ultra rare badge and the price is justifiable. If I were still a collector I would buy it. I'm going to put this on the NotSoModernDrummer.com web site and see if we get any more good info on it.